Navigate to the the News Feed Manager. To add a new News Feed, click the "New" icon in the toolbar. To edit an existing News Feed, click the News Feed's name, or check the news Feed's checkbox and press the "Edit" icon in the toolbar. Title. The Name of the News Feed. This field is required. Link. The link of this News Feed. This should normally begin with "http://". Category. The Category for this News Feed. Select from the drop-down list box of News Feed Categories. Note that News Feed Categories are separate from other Categories, such as those for Articles, Contacts, Banners, and Web Links. Alias. The internal name of the item. Normally, you can leave this blank and Joomla! will fill in a default value. The default value is the Title or Name in lower case and with dashes instead of spaces. You may enter the Alias manually. The Alias should consist of lowercase letters and hyphens (-). No blank spaces or underscores are allowed. The Alias will be used in the URL when SEF is activated. Note: If the title consists of non-Latin characters, the Alias will default to the current date and time, for example "2009-02-11-17-54-38". State. Select from the drop-down box: Published, Unpublished, Archived, or Trashed. Access. The access level needed to view the link. Order. The order of this News Feed in the list of News Feeds. The default order is to add the item to the end of the list. To select a different position, use the drop-down list box. This item will moved to the position just after the item selected from the drop-down list. 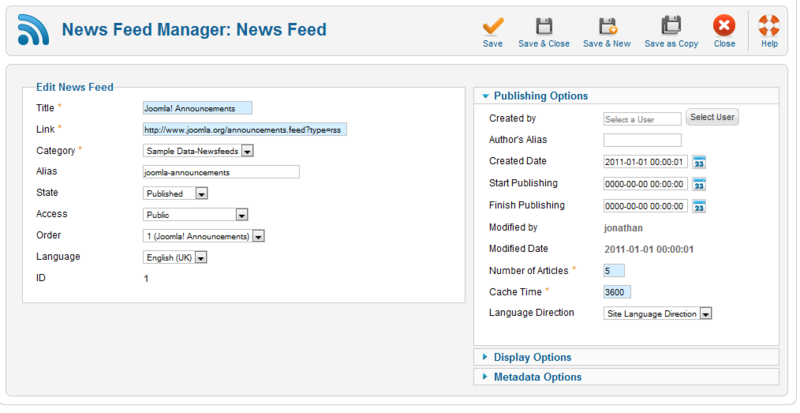 Note that the order in which the News Feeds are displayed can also be changed in the News Feed Manager. Language. The language of the selected feed. ID. The Joomla! assigned ID of the item. Created by: Shows the user that created the feed or article. Authors Alias: Sets a different name than the author's for display. Created Date: Shows the date the item was created. 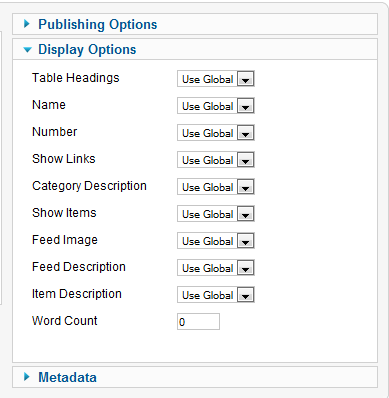 Start Publishing: An optional start date to publish the item. Finish Publishing: An optional end date for the item. Modified by: Shows the username of the last user to edit the news feed. Modified Date: Shows the last date the item was modified. 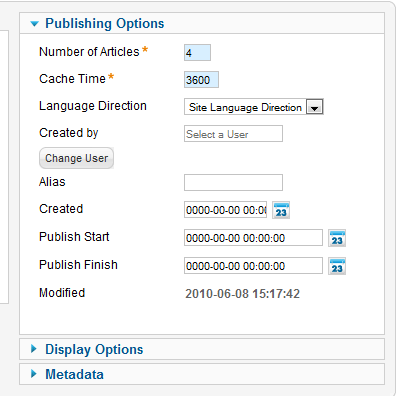 Number of Articles: Sets the number of articles in the newsfeed or category to be displayed. Cache Time: Sets the number of seconds to cache the feed locally. Language Direction: Options are Site Language Direction, Left to Right, and Right to Left. Selections available for the display options include: Use Global, Hide, and Show. Table Headings. Table Headings for the display. Number. Number of articles to display. Show Links. Links to the article or newsfeed. Category Description. Show or hide the category description. Show Items. Show the items in the category. Feed Image. (Newsfeeds only) - optionally display images. Feed Description. (Newsfeeds only) - optionally display descriptions. Item Description. Optionally show the description. Word Count. How many words are included in the item. Meta Description. 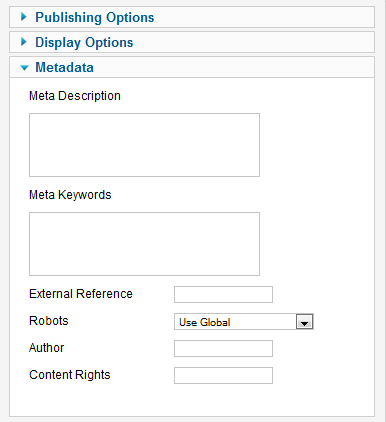 Optional text entered here will be added to thje page HTML output and may be displayed in search engine results. Meta Keywords. Optional comma seperated list that will be added to the HTML keywords output. External Reference. Allows this record to be cross referenced to external data. Robots. This will be added to the page HTML output. Options are: Use Global, Index-Follow, No index-Follow, Index-No follow, No index-No follow, and Don't display robots tag. Content Rights. Rights others have to use this content. Save. Save it and return to editing the menu details. Save & Close. Saves the item and closes the edit screen. Save & New. Saves the current item and goes directly to the New item page. Save as Copy. This button is available only when editing an existing item, not when creating a new one. Close. Return to the previous screen without saving your work. If you press Close while adding a new item, this new item will not be created. If you were modifying an existing item, the modifications will not be saved. A News Feed category must be added before any News Feed can be created. This page was last modified on 28 April 2013, at 18:38.